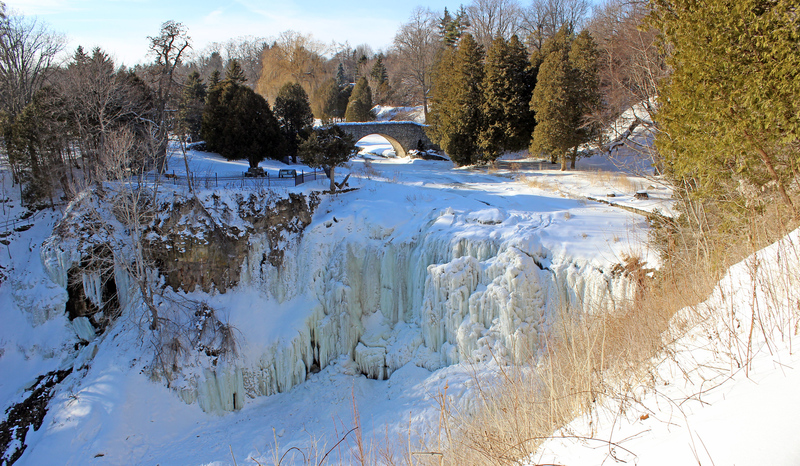 Hamilton, Ontario could be the frozen waterfall capital of the world. The city of Hamilton, Ontario is known as the city of waterfalls. With over 100 cascades and waterfalls, many of which plunge over the Niagara Escarpment, it might very well be the waterfall capital of the world. Well, you heard it here first: I’m declaring Hamilton to be the frozen waterfall capital of the world. 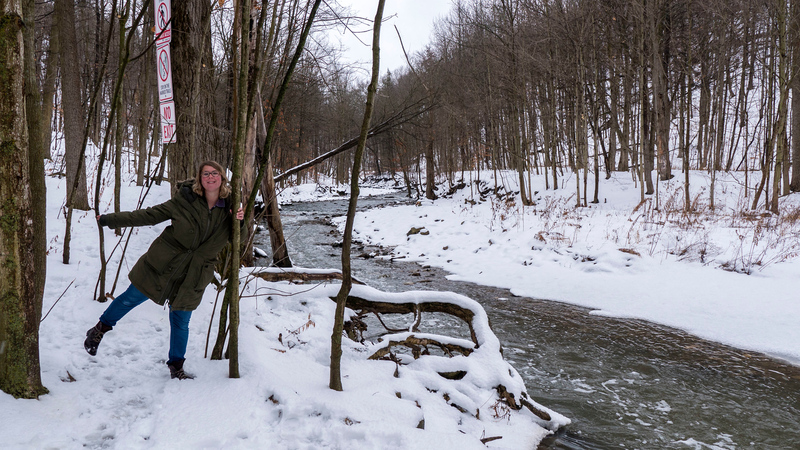 In the winter, many of these 130+ waterfalls transform into a frigid, icy landscape. 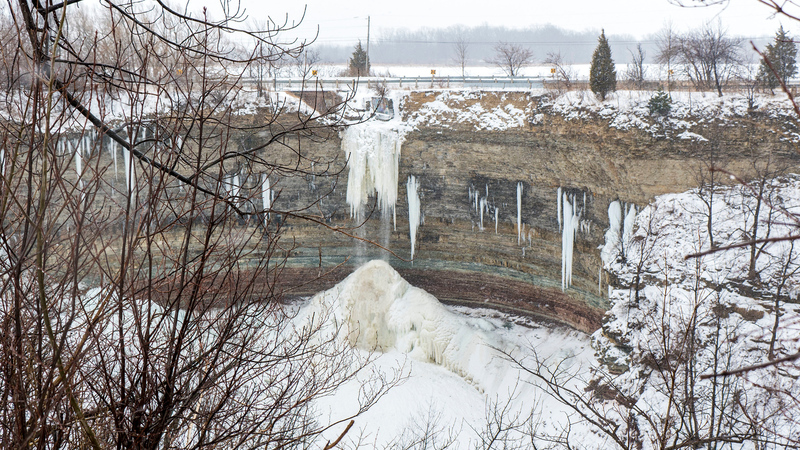 Massive clusters of gigantic icicles dangle from the escarpment, suspended in midair until the spring thaw. Depending on the time of year and the temperature, the waterfalls might be partially frozen or completely frozen. Even if you visit two years in a row, the cascades and scenery could look different every time. With 130-150 falls to explore throughout four seasons, you’ll never get bored hunting down waterfalls in Hamilton. 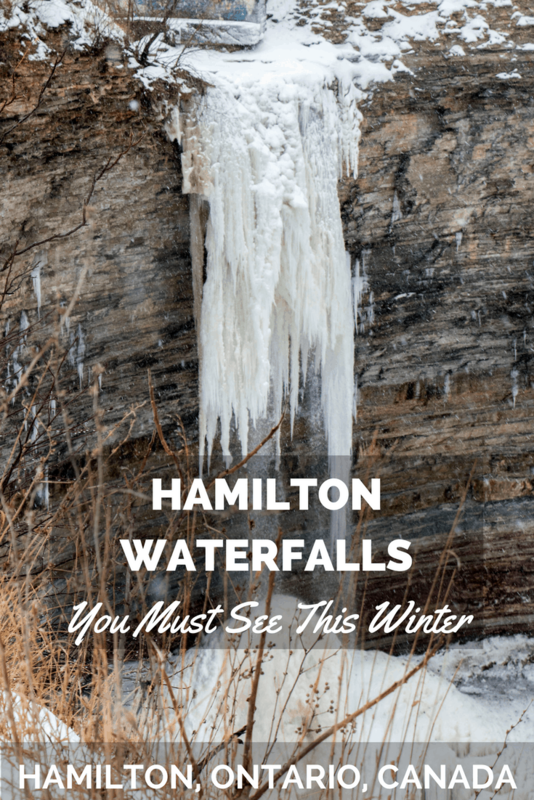 As a local to Hamilton (I was born in Hamilton and lived in Dundas for most of my life), allow me to showcase the best Hamilton waterfalls in winter. 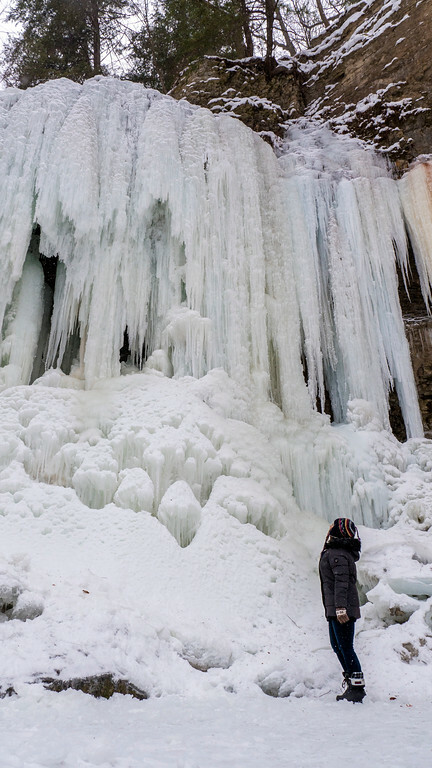 Have you seen a frozen waterfall before and where? 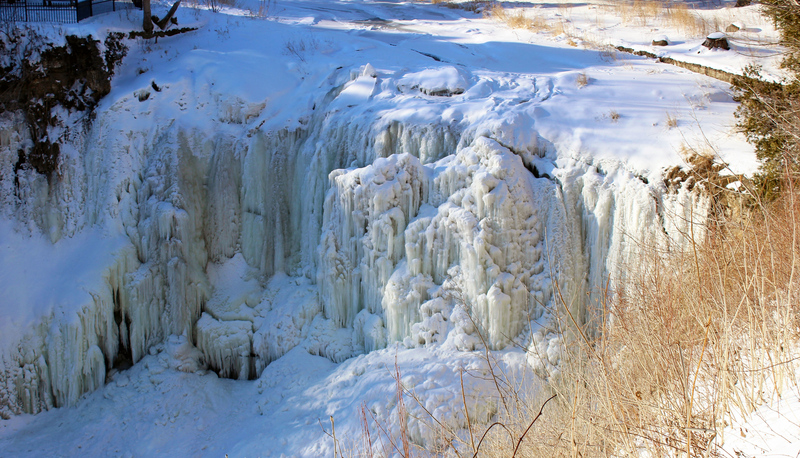 Devil’s Punch Bowl is a 121 foot ribbon waterfall that looks brilliant in both the summer and the winter months. The circular shape of the escarpment is quite distinct, yet the cliff face almost resembles Niagara’s Horseshoe Falls on a smaller scale. In the winter, the waterfall sometimes freezes into one giant icy clump. 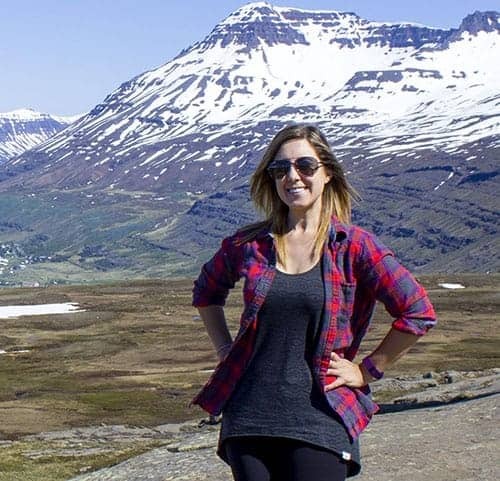 When I visited, the temperatures were fluctuating between freezing and above freezing levels. 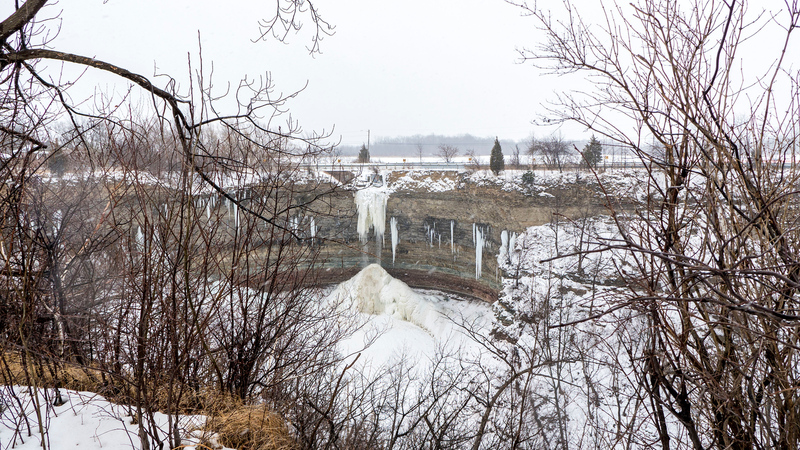 For this reason, the waterfall at Devil’s Punch Bowl was partially frozen. 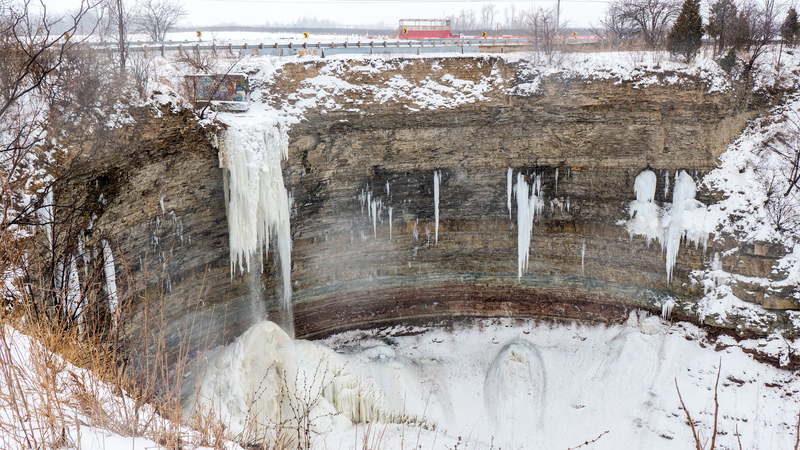 You can see gigantic masses of ice at the top of the escarpment and the bottom of the cliff, with water flowing in the middle. If it gets colder outside again, I imagine that the whole thing will freeze back up. The waterfall is very easy to visit as it’s right beside the parking lot. There’s also a scenic outlook at Devil’s Punchbowl Conservation Area. If the sky is clear, you can see all the way to Toronto. On this blustery winter day, I admired the homes down below as everything was dusted in a light layer of snow. Although it’s possible to hike to the base of Devil’s Punch Bowl, it’s fairly steep and difficult. We weren’t about to risk it as the weather was partially raining and snowing, with the ground becoming icy and slippery. If you attempt to hike to the bottom, it supposedly takes about an hour and you must hike all the way back up as there aren’t any alternate roads or routes out. Do so at your own risk. 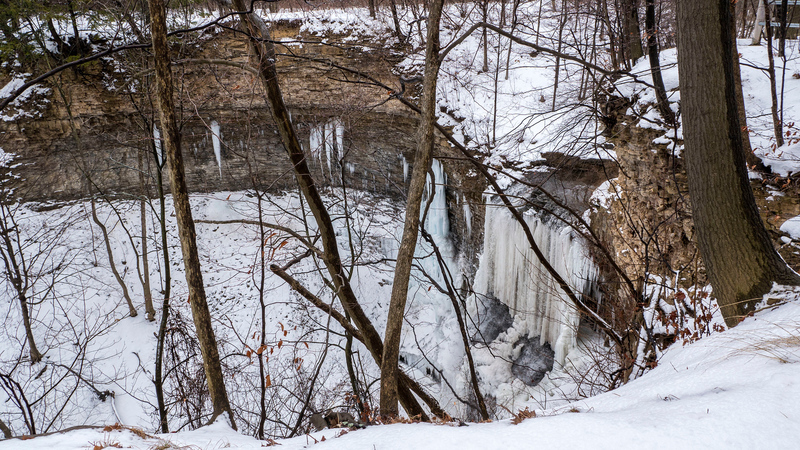 Just a short drive from Devil’s Punchbowl, Felker’s Falls Conservation Area sits just beyond a residential area. I had never heard of Felker’s Falls until moments before visiting. Out of the 100 Hamilton waterfalls, it’s not one of the popular ones. 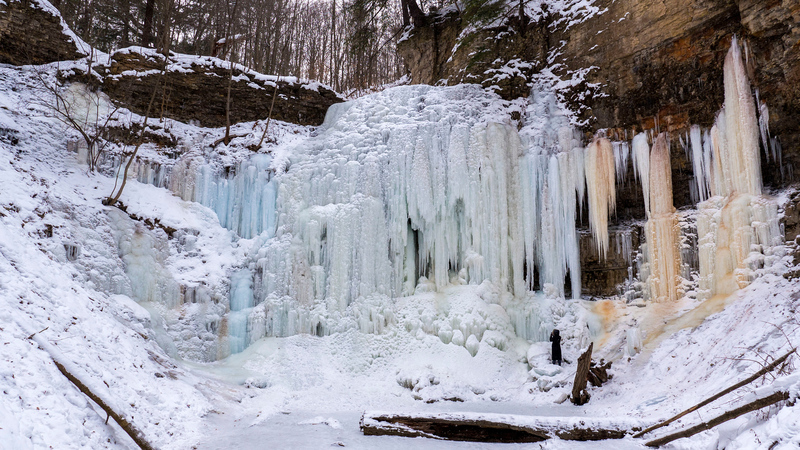 However, Felker’s Falls is a gem that you’ll definitely want to see when it’s frozen. I’m already planning my next visit in the spring, too. The height of Felker’s Falls is 22 metres (72 feet) and the falls are about 6 metres (20 feet) wide. It is a terraced ribbon waterfall that flows all year long. 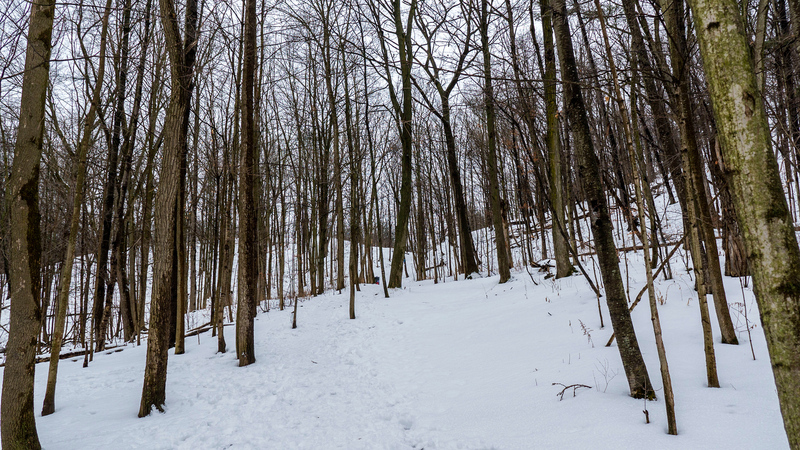 A section of the Bruce Trail winds alongside the escarpment near the top of the waterfall. When I visited with my friend, Shannon, we walked from the parking lot to the left and hiked on the trail. Little did we know, this was exactly in the opposite direction of the falls. Eventually, we turned around and backtracked to find the waterfall directly opposite the parking lot. Perhaps one of the largest and most beautiful waterfalls in Hamilton, Albion Falls is a classic cascade waterfall in the Red Hill Valley. This waterfall wasn’t frozen at all, except for a small section of ice beside it. It does freeze completely when it gets cold enough outside. Unfortunately, visitors are unable to hike down to the base of the waterfall. I hiked all around this waterfall a couple of summers ago with friends. Sadly, some people climbed beyond fences and ignored warning signs. In fact, when I visited back in July of 2016, a man died at this waterfall a couple of hours after we left. Nowadays, there are giant fences all around Albion Falls with warning signs threatening fines if anyone climbs down to the bottom. Thankfully, there are a couple of places where you can still admire the falls and capture great photographs. There’s a trail that runs around and beyond the waterfall that’s quite lovely throughout every season. My friend, Shannon, exploring Hamilton waterfalls with me. Tiffany Falls is one of my favourite Hamilton waterfalls in winter. When I checked it out, it was completely frozen from top to bottom. It’s quite a sight to behold. In the summer, it’s a 21 metre high ribbon waterfall, with a gentle cascade of flowing water. In the winter, it’s a frozen, enchanting wonderland. 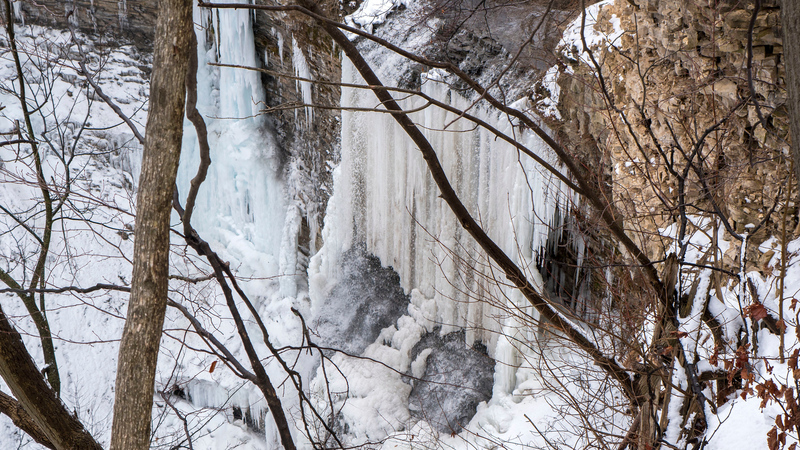 Tiffany Falls is a short walk from the parking lot, and you can even go ice climbing here in the winter. Enjoy this beautiful waterfall from its base and marvel at the huge columns of ice. Webster’s Falls holds a special place in my heart because it’s in my hometown of Dundas, Ontario. Before the dawn of social media and blogging, it was not nearly as popular of a place. I remember hiking here during school activity days and coming here during my high school lunch break (once I got my license and could drive my group of friends there). Unfortunately, it’s not possible to hike down to the base of the waterfall from the top of the falls anymore. Likewise, there are huge fences in place to ensure that visitors don’t climb to sit near the top of the falls in certain spots. I’m unhappy that I can’t enjoy the waterfall from all the various perspectives as I used to, but it’s for the safety of those visiting. 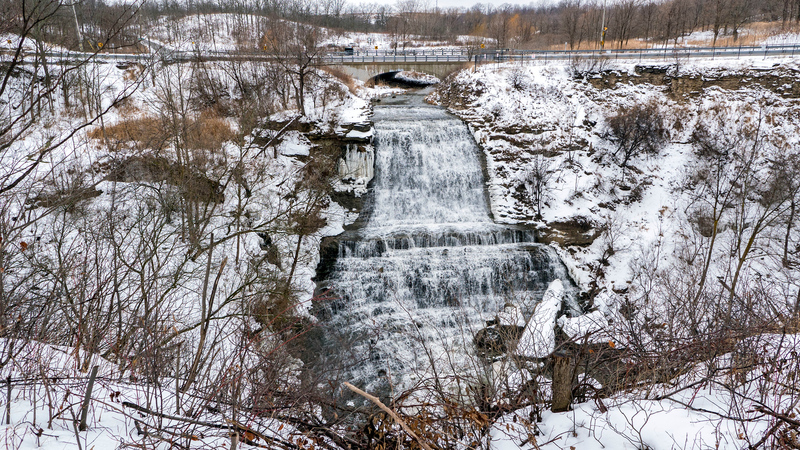 During the winter months, Webster’s Falls is much more quiet and peaceful, especially on a weekday. The waterfall is a frozen beauty in the winter, and it’s not to be missed. Be sure to also make the trip to nearby Tew’s Falls, the tallest waterfall in Hamilton. 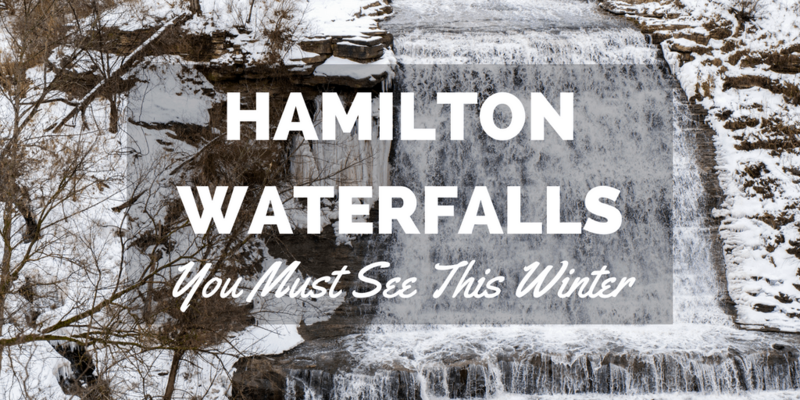 While there are numerous Hamilton waterfalls to add to your winter hiking list, these five are an excellent starting point. If you’re feeling energetic, you can see all five in one day. So, grab your waterproof winter boots, your knit winter accessories, and your camera. 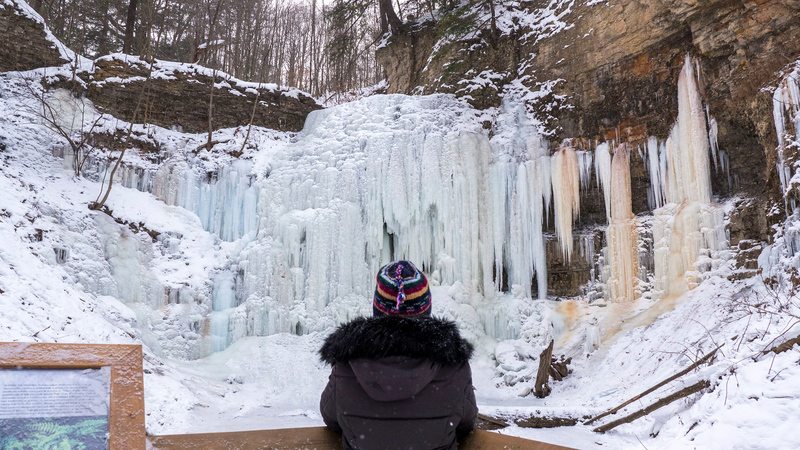 Head out to these Hamilton waterfalls to soak up the scenery of a true Canadian winter. Want to see more frozen waterfall photos? Check out my travel photo albums of Ontario. You can also purchase prints, housewares, phone cases, and even more from any of my pictures. I’ve never seen a frozen waterfall, but these look incredible! The fact that it gets so cold there that moving water freezes mid air is kind of terrifying haha. Love the name The Devil’s Punchbowl :D Amazing that you can get so close to Tiffany Falls. I bet that it’s really stunning in the summer too. It’s cool that some of these water falls are places you could get to on your high school lunch break. Even in winter, Ontario looks beautiful! I love how there is some Tiffany-blue ice within Tiffany Falls! 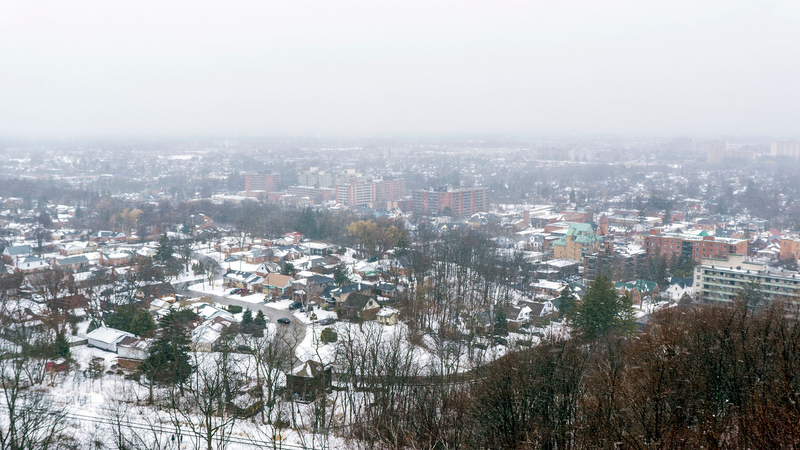 Hamilton is such a great city but I never thought of it as a winter travel destination until now. Wow! I couldn’t believe they’re really waterfalls! And they’re completely frozen! I’m totally stoke right now! I’ve seen hundreds of waterfalls but not the frozen ones! Webster Falls sure is a special waterfall for you but I also agree that before the booming of social media, everything seemed to be serene and peaceful and of course not so popular, but now although nothing is wrong about blogging and the online stuff, some people just want to take a picture or go to a certain place just for the sake of popularity. Great captures of pure white waterfalls tho! I can feel it’s mighty freezing! Ahhh good ol’ Hamilton. Steel town. It’s been awhile since i was out that way. I must plan a revisit especially since I’ve only visited Webster’s Falls and the Dundas Lookout. I was actually just planning on heading back to to fly my drone and capture more footage and pictures. Thanks for the list, maybe I’ll include those in my trip….I love learning about things in my own backyard. Bookmarked! My parents live not too far on the other side of the border. Would be great to go on a day trip here to check out these beautiful falls (and avoid the Niagara Falls crowds). Thanks for the awesome guide. This looks like such a cool experience. I’ve never seen a frozen waterfall in person and Hamilton looks likeTHE PLACE to experience them. Tiffany Falls looks like the coolest one just because it looks massive! There’s something so magical about a frozen waterfall! The Tiffany falls look beautiful! Amazing! I´m going to be at Hamilton on December. Must I see the frozen waterfalls? Since I don´t drive, is there other ways to get to the waterfalls? 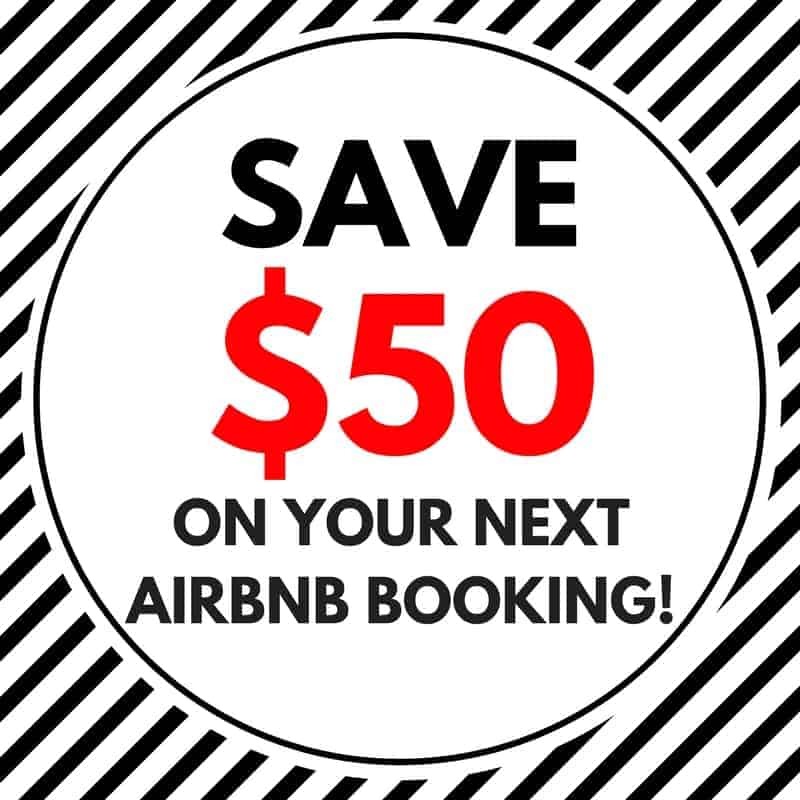 You might be able to take public transit to some of them (use Google Maps to figure it out) or you can take an Uber! The waterfalls won’t be frozen in December, but they will still be beautiful! They look beautiful all times of the year. Enjoy!